Many believe the story to be authentic, but most historians believe it is a legend, similar to the story of George Washington chopping down the cherry tree. Historians point out the story of the angelic vision was unknown during Washington’s life. It is first found in the writings of Charles Alexander (1836-1927) who wrote fictional “dream” stories about many famous Americans. Alexander wrote that in 1859, a 99-year-old man named Anthony Sherman, who claimed to have been an aide to George Washington, confided to the author. In the National Tribune, 1880, an article appeared giving an account of the "Vision of Washington" at Valley Forge. The article was reprinted in the Stars and Stripes on December 21, 1950. The soldier mentioned as having a first-hand account of the "Vision," Anthony Sherman, was a soldier in the Continental Army. However, according to his pension application, written by him, he states that he was at Saratoga under the command of Benedict Arnold at the end of 1777 and only joined the main forces in 1778 in New Jersey just before the Battle of Monmouth. "I do not know whether it is owing to the anxiety of my mind, or what, but this afternoon, as I was sitting at this table engaged in preparing a dispatch, something seemed to disturb me. Looking up, I beheld standing opposite me a singularly beautiful female. So astonished was I, for I had given strict orders not to be disturbed, that it was some moments before I found language to inquire into the cause of her presence. A second, a third, and even a fourth time did I repeat my question, but received no answer from my mysterious visitor except a slight raising of her eyes. By this time I felt strange sentiments spreading through me. I would have risen, but the riveted gaze of the being before me rendered volition impossible. I assayed once more to address her, but my tongue had become useless, even thought itself had become paralyzed. A new influence, mysterious, potent, irresistible, took possession of me. All I could do was to gaze steadily, vacantly at my unknown visitor. Gradually, the surrounding atmosphere seemed as though becoming filled with sensations and luminous. Everything about me seemed to rarify, the mysterious visitor herself becoming more airy, and yet more distinct to my sight than before. I now began to feel as one dying, or rather to experience the sensations which I have sometimes imagined accompany dissolution. I did not think, I did not reason, I did not move; all were alike impossible. I was only conscious of gazing fixedly, vacantly at my companion. "At that moment I beheld a dark, shadowy being, like an angel floating in mid-air, between Europe and America, dipping water out of the ocean in the hollow of each hand. He sprinkled some upon America with his right hand, while with his left hand he cast some on Europe. Immediately a dark cloud raised from these countries and joined in mid-ocean. For a while it remained stationary, and then moved slowly westward, until it enveloped America in its murky folds. Sharp flashes of lightning passed through it at intervals, and I heard the smothered groans and cries of the American people. "At this the dark, shadowy angel turned his face southward, and from Africa I saw an ill-omened spectre approach our land. It flitted slowly over every town and city. The inhabitants presently set themselves in battle array against each other. As I continued looking, I saw a bright angel, on whose brow rested a crown of light, on which was traced the word "Union," bearing the American flag, which he placed between the divided nation, and said, 'Remember ye are brethren.' Instantly the inhabitants, casting from them their weapons, became friends once more and united around the National Standard. "And again I heard the mysterious voice saying, 'Son of the Republic, look and learn.' At this the dark, shadowy angel placed a trumpet to his mouth and blew three distinct blasts; and taking water from the ocean, he sprinkled it upon Europe, Asia, and Africa. Then my eyes beheld a fearful scene: from each of these countries arose thick, black clouds that were joined into one. And throughout this mass there gleamed a dark red light by which I saw hordes of armed men, who, moving with the cloud, marched by land and sailed by sea to America, which country was enveloped in the volume of the cloud. And I dimly saw these vast armies devastate the whole country and burn the villages, towns, and cities that I beheld were springing up. As my ears listened to the thundering of the cannon, clashing of swords, and the shouts and cries of millions in mortal combat, I heard again the mysterious voice saying, 'Son of the Republic, look and learn.' When the voice had ceased, the dark, shadowy angel placed his trumpet once more to his mouth and blew a long and fearful blast. "Instantly a light as of a thousand suns shone down from above me, and pierced and broke into fragments the dark cloud which enveloped America. At the same moment the angel, upon whose head still shone the word "Union," and who bore our national flag in one hand and a sword in the other, descended from the heavens, attended by legions of white spirits. These immediately joined the inhabitants of America, who I perceived were well-nigh overcome, but who immediately taking courage again, closed up their broken ranks and renewed the battle. Again, amid the fearful noise of the conflict, I heard the mysterious voice saying, 'Son of the Republic, look and learn.' As the voice ceased, the shadowy angel for the last time dipped water from the ocean and sprinkled it upon America. Instantly the dark cloud rolled back, together with the armies it had brought, leaving the inhabitants of the land victorious. "The scene instantly began to fade and dissolve, and I at last saw nothing but the rising, curling vapor I at first beheld. This also disappearing, I found myself once more gazing upon the mysterious visitor, who, in the same voice I had heard before, said, 'Son of the Republic, what you have seen is thus interpreted: Three great perils will come upon the Republic. The most fearful is the third, passing which the whole world united shall not prevail against her. Let every child of the Republic learn to live for his God, his land, and the Union.' With these words the vision vanished, and I started from my seat, and felt that I had seen a vision wherein had been shown me the birth, progress, and destiny of the United States." American spirits reached a low point during the harsh winter of 1777-78. British troops had marched triumphantly into Philadelphia the previous autumn. Philadelphia was the largest city in the Colonies and the seat of political power. After the British swept into Philadelphia, the Continental Congress had flee to west, first to Lancaster then to York. Washington's army had spent the summer of 1777 fighting a string of losing battles. The Americans harassed the British army in skirmishes and minor battles for much of the fighting season. In the fall, the Americans showed pluck at the Battle of Brandywine in September and the Battle of Germantown in October. Yet the Americans were unable to keep the British out of Philadelphia. In December, Washington marched his tired, beaten, hungry and sick army to Valley Forge, a location about 20 miles northwest of British-occupied Philadelphia. From Valley Forge, Washington could keep an eye on General Howe's British army ensconced in Philadelphia. At Valley Forge, there were shortages of everything from food to clothing to medicine. Washington's men were sick from disease, hunger, and exposure. The Continental Army camped in crude log cabins and endured cold conditions while the Redcoats warmed themselves in colonial homes. The patriots went hungry while the British soldiers ate well. Terms of enlistment were ending for many soldiers in Washington's army. The General wondered if he would even have an army left when the spring thaw finally arrived. General Washington was upset that local farmers were hoarding much-needed food waiting to earn higher profits in the spring. Some farmers even sneaked grain into Philadelphia to feed the British army, who paid in gold or silver. With each passing night came more desertions. Washington grew privately disgusted at the lack of commitment of his so-called patriot fighters. Then there was the grumbling of some in Congress and among some of Washington's own officers. Washington's leadership skills were openly questioned. Many said General Horatio Gates was better-suited to leading the army. After all, hadn't he scored a major victory in October at the battle of Saratoga.? Within the environment of cold, deprivation, and rebellion, how long could Washington and his army endure? Dear Sir: It is with great reluctance, I trouble you on a subject, which does not fall within your province; but it is a subject that occasions me more distress, than I have felt, since the commencement of the war; and which loudly demands the most zealous exertions of every person of weight and authority, who is interested in the success of our affairs. I mean the present dreadful situation of the army for want of provisions, and the miserable prospects before us, with respect to futurity. It is more alarming than you will probably conceive, for, to form a just idea, it were necessary to be on the spot. For some days past, there has been little less, than a famine in camp. A part of the army has been a week, without any kind of flesh, and the rest for three or four days. Naked and starving as they are, we cannot enough admire the incomparable patience and fidelity of the soldiery, that they have not been ere this excited by their sufferings, to a general mutiny or dispersion. Strong symptoms, however, discontent have appeared in particular instances; and nothing but the most acitive efforts every where can long avert so shocking a catastrophe. Our present sufferings are not all. There is no foundation laid for any adequate relief hereafter. All the magazines provided in the States of New Jersey, Pensylvania, Delaware and Maryland, and all the immediate additional supplies they seem capable of affording, wil not be sufficient to support the army more than a month longer, if so long. Very little been done to the Eastward, and as little to the Southward; and whatever we have a right to expect from those quarters, must necessarily be very remote; and is indeed more precarious, than could be wished. When the forementioned supplies are exhausted, what a terrible crisis must ensue, unless all the energy of the Continent is exerted to provide a timely remedy? Help came in the form of a Prussian volunteer, Baron Von Steuben. The military leader was aghast at the lack of American discipline. At Washington's urging he trained the Continental Army, Prussian-style. The troops slowly became more professional. Among the soldiers who remained, confidence grew. Over the course of the winter, the weather improved somewhat. Food trickled in from the surrounding countryside. Many wives of soldiers spent time at Valley Forge over the winter. Washington was able to quash those who questioned his leadership abilities. The Continental Army encamped at Valley Forge in the fall of 1777 with about 12,000 men in its ranks. Death claimed about a quarter of them before spring arrived. Another thousand didn't reenlist or deserted. But the army that remained was stronger. They were fewer, but more disciplined. They were weary, but firmly resolved. 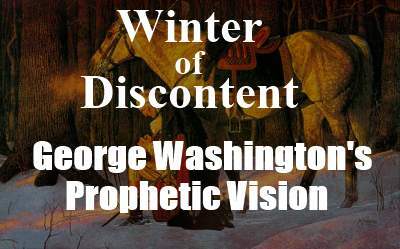 The Prophetic Dream Of General George Washington At Valley Forge: Did One Man's Dream Set the Course for a Fledgling Nation?